Support for Scalable Vector Graphics (SVG) has become one of the most requested features for implementation in Internet Explorer, and is a powerful way to add high-fidelity, easily scalable visuals—from small and simple to large and complex— to a website without the need for a plug-in or separate viewer. For more information about SVG support in Internet Explorer 9, see MSDN. For more information about SVG, see the svg element reference page on MSDN. Internet Explorer 9 also supports these elements’ associated DOM interfaces. Following are examples of each of the aforementioned shapes elements. After the markup is a screenshot of the corresponding result in Internet Explorer 9. For more information, see the rect element reference page on MSDN. For more information, see the circle element reference page on MSDN. For more information, see the ellipse element reference page on MSDN. For more information, see the line element reference page on MSDN. A “polyline” is defined in SVG to be several connected lines, often forming an “open” shape, or a polygon with one or more missing sides or non-convex shapes. For more information, see the polyline element reference page on MSDN. A polygon is a closed shape. For more information, see the polygon element reference page on MSDN. A clipping path cuts or “clips” the area that a color, pattern, or image can be drawn. All parts of the graphical element that lie outside the clipping path are not drawn. Clipping paths are fully opaque; the portion of the graphical element that is outside the clipping path is completely invisible. In SVG, the overflow and clip properties establish initial clipping paths, or shapes in which content will be displayed. By default, the initial clipping path is defined as the SVG viewport, or the rectangular area of the page where the SVG content is displayed. The clipPath element defines a clipping path. The clipping path is then referenced using the clip-path property. The clip-rule property applies to graphic elements within a clipPath element, and the clipPathUnits attribute defines a coordinate system for the contents of the clipPath. Clipping paths can be applied to text as well as colors, patterns, and images. Clipping functionality can be accessed programmatically with the SVGClipPathElement DOM interface. Following is a simple example of an SVG clipping path. This example uses the clipPath element to define a clipping path in the shape of a circle. The clip-path property is then used to apply the clipping path to a rectangle. This produces the following in Internet Explorer 9. A mask is similar to a clipping path, except it is semi-transparent. Masks are often used for compositing foreground objects into the current background. The mask element defines a mask. The mask is then referenced using the mask property. The following is a simple example of an SVG mask. This example uses the mask property to define a mask in the shape of three adjacent circles with different colors. The mask property is then used to apply the mask to a purple rectangle. This produces the following in Internet Explorer 9. Arbitrary transformations on any element and the transform attribute. The viewBox and preserveAspectRatio properties (including interaction with the overflow property). Support for transforms and transform list types. Internet Explorer 9 also supports the DOM interfaces associated with SVG coordinate systems and transformations. SVG provides the ability to paint or stroke shapes and text using color, gradients, or patterns. Internet Explorer 9 supports SVG gradients and patterns, as specified in the Gradients and Patterns module of the SVG 1.1 (Second Edition) specification. Pattern support is provided through the pattern element and its attributes. Like gradients, pattern elements can be used in the fill and stroke properties of SVG shapes. For example, consider the following markup. In this example, the pattern element defines a pattern that consists of an alternating small blue square and tiny yellow circle. The ellipse that is then specified is given a fill of the pattern. The following image shows how this appears in Internet Explorer 9. Internet Explorer 9 also supports the Interactivity module’s SVGCursorElement DOM interface. Additionally, the Internet Explorer 9 supports the focusable attribute as specified in the Interactivity module of the SVG Tiny 1.2 specification. The following markup shows a very simple example of SVG interactivity in action. When this snippet is loaded, it displays a small red circle. Clicking the circle causes it to grow to twice its size. 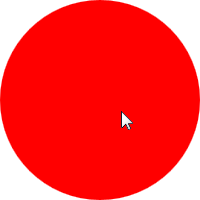 The same effect can be achieved with mouseover and mouseout events, which will cause the circle to grow and shrink just by moving the cursor over and off of it. SVG enables linking out of SVG content to other pages, as well as predefined views of SVG documents. Views are useful when you want to link directly to, for instance, a close-up of a diagram. Internet Explorer 9 supports SVG linking and views, as specified in the Linking module of the SVG 1.1 (Second Edition) specification. This includes support for the a and view elements. The Linking module’s associated DOM interfaces—SVGAElement and SVGViewElement—are also supported. Just like in HTML, the a element is used to create a hyperlink in SVG. For instance, the following markup provides a hyperlink on a rectangle. Views can be used to instruct the browser to display an SVG image in a certain way. For instance, the following markup defines a link to a view. In this example, the rect-view view is defined as a viewBox with the given coordinates. When the link (the text “Go to Rectangle”) is clicked, the rect-view view appears, which reveals the red rectangle. The following markup defines another link to a view. In this example, the circle-view view has the attribute preserveAspectRatio set to none. This means that, even though the shape is a circle, it will not scale uniformly to fill the specified viewBox rectangle when the view is invoked. Instead, it will stretch non-uniformly so that its bounding box exactly matches the viewBox rectangle. This markup appears as follows in Internet Explorer 9 when the page is first loaded. When you click “Go to Circle”, the circle-view view is invoked, and the circle is stretched to fill the viewBox rectangle. This makes it appear to be an ellipse. Painting and color are essential components of SVG. The concept of painting encompasses fills (solid color, gradients, patterns), strokes (lines drawn along paths), and marker symbols (applied to the end of line segments; for instance, arrowheads), and can also incorporate opacity. Fills and strokes can apply to paths, text, and shapes. The Painting module’s associated DOM interfaces—SVGPaint and SVGMarkerElement—are also supported. Several examples of fills and strokes in SVG are included in the Paths section of this document. SVG paths are outlines of shapes. They can be filled in, stroked (a line is drawn along the path), or used as clipping paths (cutouts of other shapes). Internet Explorer 9 introduces support for SVG paths, as specified in the Paths module of the SVG 1.1 (Second Edition) specification. This includes support for the path element, as well as the d property, which enables parsing of path data. The Paths module’s associated DOM interfaces are also supported. The path element enables many different developer scenarios. Following are just a few simple examples. After the markup is a screenshot of the corresponding result in Internet Explorer 9. SVG documents can include text. Text is rendered just like other graphic elements in SVG, which means that coordinate system transformations, painting, clipping, and masking can all be applied to text. Internet Explorer 9 supports text rendering, as specified in the Text module of the SVG 1.1 (Second Edition) specification. The text element specifies the characters to be drawn. Because SVG does not break lines or wrap words automatically, you must determine line breaks in advance. To adjust text properties (such as font, weight, color, kerning, and many others) within a line of text, SVG provides the tspan element. Internet Explorer 9 also supports the Text module’s associated DOM interfaces.